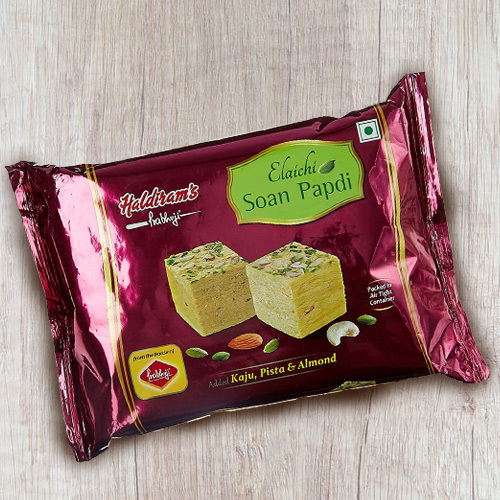 On Mothers Day, implement an astounding impact with this Exclusive 1/2 Kg Soan Papdi Soan Papdi from Haldiram and stay forever in the lovely heart of your mother. 1/2 Kg. (Gross Weight) Soan Papdi from Haldiram / Reputed Sweets Shop with Bhujia. 1 Kg (Gross Weight) Soan Papdi from Haldiram / Reputed Sweets Shop. 1 Kg. (Gross Weight) Soan Papdi from Haldiram / Reputed Sweets Shop with Bhujia.